Since he was unleashed on the world a little more than a week ago, the Flyers' new mascot, Gritty, has been meme-ified, mocked, and made into an anti-Trump protest icon. But no one has gotten to know the "real" Gritty. Until now. 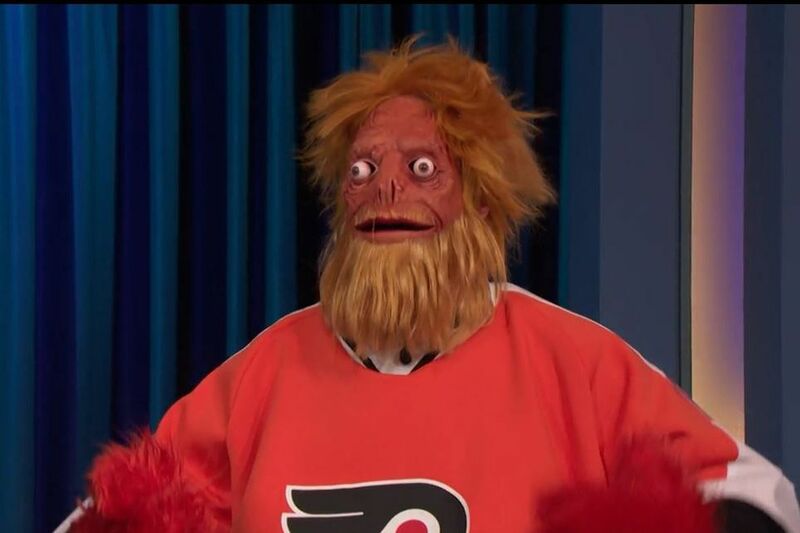 Late night, Conan O'Brien focused on the Flyers mascot on Wednesday's episode of Conan, in which the comedian brought out Gritty for an interview with the "man" — if you can call it that — behind the mask. As O'Brien said Wednesday, the interview would be Gritty's first. "Gritty has made some appearances on local and national TV, but one thing no one has done yet is interview the person inside the Gritty costume to find out more about Gritty," O'Brien said. "We wanted to be the first. That's why we flew him in from Philadelphia to be here tonight." What was under Gritty's mask, however, was arguably more disturbing than his initial big reveal. As it turns out, according to Conan, Gritty is an actual monster, even without the suit — complete with crab claw hand, bulging eyes, and a Hellboy-like visage. But despite his appearance, the guy inside the Gritty costume is pretty normal, and had a series of regular jobs before becoming a mascot. "[I did] mostly over-the-phone stuff. A little Uber, a little Postmates," Gritty said. "I'm a part-time paramedic. But now, with this, I finally feel like I've found my true calling." Funny, but eagle-eyed Flyers fans will notice that Conan's Gritty isn't the real Gritty — just like the one that appeared on Last Week Tonight on Sunday. Instead, it's a cheap imitation, but you have to give the show props for creating a full-body mascot suit from a newly debuted character in a little over a week. The real Gritty, the one we have come to know and fear, for the record, has made only one official appearance on late night TV. Last week, he stopped by The Tonight Show Starring Jimmy Fallon, where he got into a fight with comedian Ricky Gervais. Elsewhere, Gritty has been a target for nightly roasts on shows like The Late Show with Stephen Colbert, Saturday Night Live, and The Daily Show. But despite the histrionic responses to the Flyers' new mascot, Gritty is likely here to stay — at least according to Tom Burgoyne, who has played the Phillie Phanatic for the last 30 years. "I honestly can't remember a mascot introduced in the age of social media that didn't get some kind of backlash," Burgoyne told the Inquirer last week. "I actually think it's really cool-looking, and kids are going to think he's really cool."